Hey there people! I'm a Tassie girl living on the Gold Coast. I make my money working in hospitality, but if I could I'd spend all my time writing! The track for the Box Forest Circuit leaves from O'Reilly's. Follow the road to the top of the mountain, where the rainforest resorts are, and where hungry parrots flock to adorn tourist shoulders for photos, in exchange for food. If you have any food on you, you will undoubtedly be assailed by a range of these cheeky, feathered, bread-robbers. Warning: they are very cute, and you may have given them all your food before you even know what's going on. The Box Forest Circuit is 11km long. It took about 3.5 hours to complete the track. 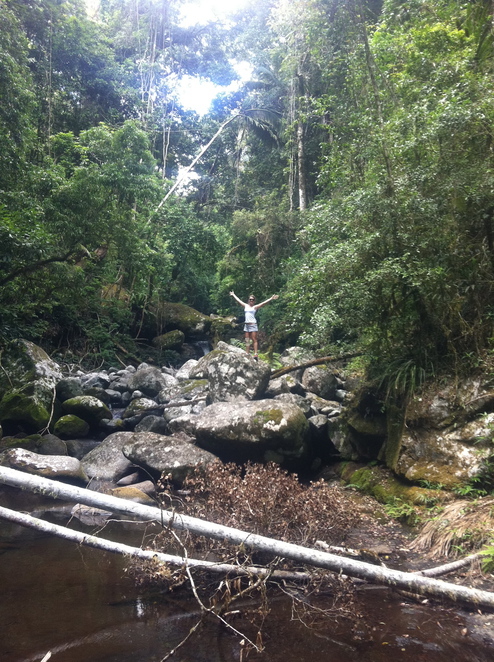 This includes several long stretches of time spent going "oooooh" and "ahhhhh" over waterfalls, clambering over rocks to reach the optimal position for a photograph, and stopping to search for rustling wildlife such as pademelons and bearded dragons. I am only going to talk for a short time about the waterfalls, because I really think you should head up there and see for yourself. They are glorious cascades of woodland whimsy, tinkling and shining in the deep silent majesty of the forest. You feel like you are about to see a fairy, but really the only woodland creature you are about to see is a leech fastening onto your leg. Warning: Leeches populate some of the areas in which you will be walking. Unlike with the birds, you will not have an urge to feed them. I did not fall victim, but both my companions suffered attempted leech attacks, all of which were repulsed before any blood was stolen. I would advise you to take a sachet or two of salt just in case. Knowing you are armed and prepared to respond decisively to any bids to feed upon your blood will make you feel more secure as you navigate the riverbeds. Or wear long socks and leggings if you're extra paranoid. The track is well signposted, and didn't at any point leave us wondering where the hell we were, which was nice. After a couple of kilometres, the circuit part of the track begins. This takes you down into a valley, and leads you back up a hill. If you want to minimise the upwards time, take a right when you reach the point at which the circuit starts. When we went (two weeks ago), we only ran into two other groups (both couples). 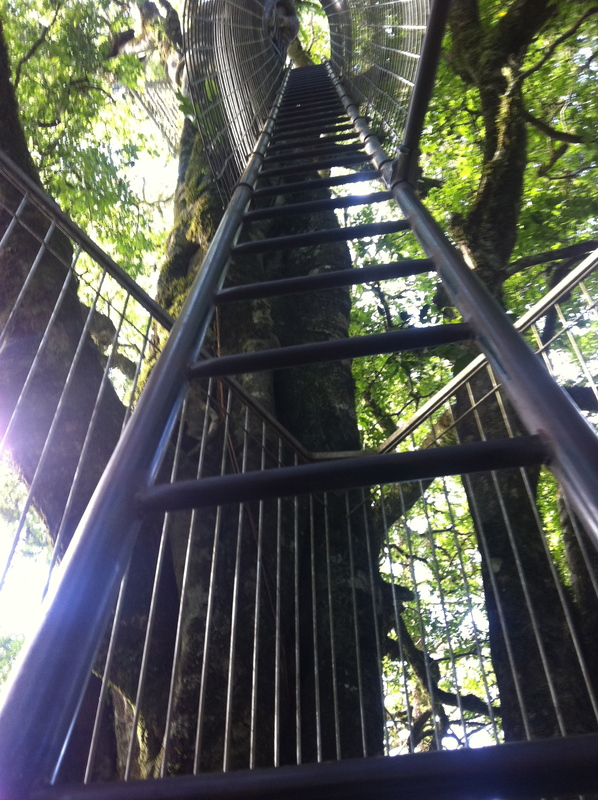 On the way back, you can check out the Treetop Walk. In its heyday, this walk was revolutionary and a source of wonder for visitors. Now, it is rusty, and the source of a potential disaster for tourism in Australia. The suspended walkways are looking a bit old, and feel about as safe as suspending your Granny from one side of a creek to another and walking over her. I am exaggerating – I am certain the Treetop Walk is perfectly safe, but it is definitely not as new as it once was 25 years ago. Not that I can talk. The Walk is 180m long, and is located 15m above the forest floor. Two observation decks have been constructed in a Strangler Fig above the walkway, the highest one being 30m above the ground. Placing my life in the hands of a tree which has been named after a form of murder did not seem like a wise move to me. 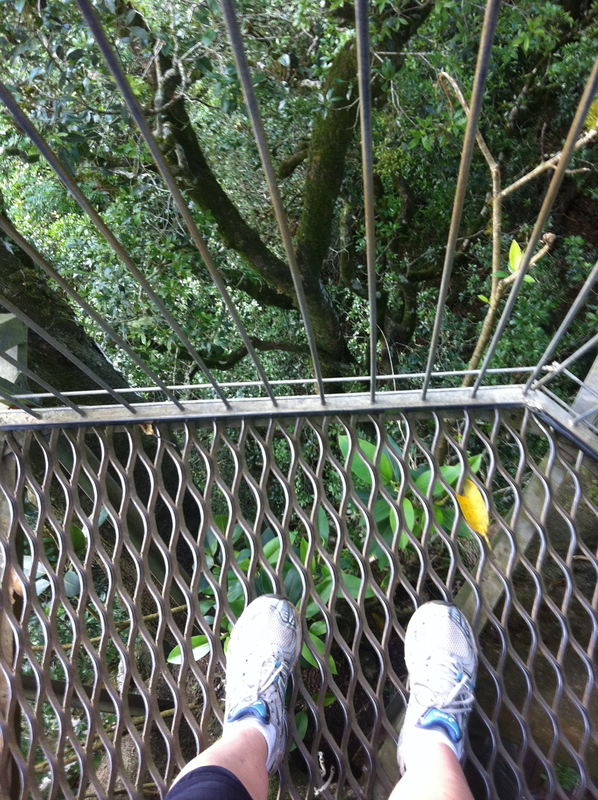 The scariest part is climbing to the highest deck. The ladder is pretty much vertical, which, as you climb, makes you feel as though you are actually pulling the ladder backwards and off the tree as you climb. The view from the top would have to be the one of the most unique ways of seeing a rainforest. Now you know what life feels like for a monkey, viewing the world from the canopy as you cling closely to the comfort of the solid Strangler Fig. When get back to the car-park, make sure you check your backpack for crumbs for the birds, check your shoes for leeches, and check your photos for fairies….. Instructions of exactly where you drive to, to start this, would be helpful. The Hinterland is a huge area, just to say "from O'Reillys" is not good enough.